This week I wanted to address the one big question that always comes with joining Magic Online. What is the best format to start with? This question is almost always asked in conjunction with the concept of "I don't want to spend a fortune right out of the gate". Now there are a handful of players out there who will tell you that the answer is block constructed. I'm not going to disagree with this since I'm not really familiar with the "go to" cards within that format and its costs. The other answer you get on a regular basis is to join in Pauper... now this is something I can sink my teeth into! For those who are not familiar I write a weekly article on this site where I build casual Pauper decks and then every other week I put together information and statistics with regards to what the current playing environment is within competitive Pauper over the past two weeks. I decided that an article on starting Magic would not be complete without a full guide to Pauper. Over a year ago I had started a series of articles on PureMTGO with regards to playing MTGO while on a very strict budget, called A Poor Man's Guide to Magic. There was some great content in this series (if I can be modest for a minute), but real life had caught up to me and starting a new job meant I didn't have time for Magic any more. I left off with the series talking about PreConstructed decks and was almost finished an article that was talking entirely about Pauper, but because of my leaving it never saw completion. Now I know significantly more about the format and hopefully I can provide everyone with a detailed guide on the format! I would like to think that at this point most of us are at the very least familiar with the Pauper format and all that it entails. For those of you who aren't, Pauper is a format where only cards at the common rarity are legal in decks. The format is played (officially) with the Classic cardpool and has its own banned and restricted list, which can be found here. Decks are built in the same way as in most constructed formats, where you have 60 cards in the maindeck and then a 15 card sideboard for those best 2 out of 3 matches. Wizards does currently support this as a tournament format and you can find at least two Daily Events for the format as well as 2-man queues, which launches whenever you find a second person to sit at the cost of 2 Tickets per match. The payout on the Pauper 2-man queues is a pack of M12 (soon to be M13) for an assumed value of doubling your money (in reality the current price on M12 has dipped and its only a minimal gain). If you're interested in the daily schedule for Wizards supported tournaments then you can check the weekly calendar out here. In addition to the support by Wizards this format has gotten a lot (perhaps an understatement) of support from the community as well. Maybe it is the appeal of being able to play at a highly competitive level for a cheap cost or just finally being able to do something with all of those commons you have sitting around gathering dust, but whatever it is the community loves the format. * Prizes are also available for places five through eight, but vary between events. Check the following posts for example information or simply go to the Wizards' PRE Forum for weekly information. In addition to these there is another event that is brought to you by PauperKrew.com and Gatherling.com, which is a Standard Pauper event. This event appears to be an every Wednesday event, but check the Wizards' forums for details on a weekly basis. For questions regarding this event I recommend talking to ChrisJW in game. I'm not going to spend any time breaking down each type of sub-format for Pauper, but there are people out there who play further modified options such as Standard or Modern Pauper. Instead I'm going to focus on the classic version of Pauper as supported by Wizards. PDCMagic.com - A site for everything and anything Pauper from Classic to Standard. MTGSalvation Forums - Pauper section of the MTGSalvation website for primers and general Pauper discussion. Anything But Articles - As seen here on PureMTGO this is the archive of my articles past and present where you can read about casual Pauper and get information regarding the current Competitive Pauper Meta. Daily Event Results - You can find the results from Daily Events; just keep any eye out for those labeled "Pauper Daily". Format Description and B&R - Wizards' description of the format as well as the banned and restricted list for the format. When you sit down and set a game to "Pauper" what you're going to be starting is a game that is classic Pauper. This is the type of Pauper that is most often talked about and the one that is run when it comes to Wizards' Daily Events. Each week there are approximately 18 Pauper DEs that are scheduled on the Wizards calendar. This is almost half of what it used to be based upon a recent "cleaning" of the competitive tournament schedule that Wizards did. Despite this the Pauper community is still out there showing up for games and playing hard. In my regular column I feature a look at the competitive meta for the past two weeks and if you're interested in playing competitively I do recommend checking it out. The first deck on our list is DelverBlue. When I first started working on writing about competitive Pauper I had merged this with other versions of MonoBlue Control (MUC), but since have learned the error of my ways. Classifying Delver Blue is something that I hate to do because it really holds an equal balance between both aggro and control. One of the biggest reasons that I fought to keep these two sides together at one is because that Delver Blue, while maintaining a heavy creature base, is a very strong control deck. The deck manages to do this mostly through the addition of Spellstutter Sprite and, in a lesser role, Cloud of Faeries. The one thing you'll notice about this deck is that it seems very light on Counterspells, but whenever you sit across from the deck it never feels that way. This is where the Spellstutter Sprites come into play, acting as an additional 4 Counterspells. These, in addition to the non-creature spells, account for a total of 11 Counterspells in this list. Now there are many different changes that can be made to a list like this, which adds stuff like Mana Leak or additional Dazes. The other element to these decks that make the Counterspells feel more oppressive are the array of cheap draw spells. Several people have talked about the power of Gush in this format, but there are other draws as well. I won't go into more details since I talked about it in an earlier article. Things like Preordain, Think Twice, Accumulated Knowledge, and even Gitaxian Probe allow this deck to draw into a critical Counterspell. When it comes to the creature base, a full set of Ninja of the Deep Hours is more than enough to keep this deck drawing at least one additional card each turn (not to mention allowing repeated use of Spellstutter Sprite). Another great addition to the Spellstutter Sprites is the use of Snap, which has been a relatively important addition to the deck since it can up that Counterspell total up to 15. Spells like Snap and Cloud of Faeries have really given this deck an edge when it comes to mana base as well. In more formats and most tournament decks you'll find that 24 seems to be a magic number when it comes to creating a mana-base for a deck. This deck is able to heavily cheat this by only running 17 on average. This leaves room for seven additional cards that can be used to sure up the deck and since the mana curve is so low (the only spells at 4cc+ are ones that can be "cheated" into play for a cheaper cost) the deck really doesn't need more than 17 lands. Spire Golem is another card that is overlooked and essentially works the same way as Snap since you're able to cast it without leaving mana tapped at the end of your turn. The low mana curve even plays down to a number of strong 1 cost creatures that we've been introduced to in recent sets. Delver of Secrets is the obvious front runner as it becomes a 3/2 with evasion and then Phantasmal Bears, while they have the typical phantom drawback, work as a 2/2 body for the one cost. While this particular list doesn't show it, Stitched Drake is another great addition to this deck in small quantity. Rarely do we get a drake that has a power and toughness on par with its mana cost, but this guy goes above and beyond for the simple cost of a creature from your grave. There is a lot of potential for this deck as something for the new-to-format control players. The printing of Delver of Secrets has allowed this deck to move from being completely focused on the control aspect to a deck that can provide quite a heavy aggro front as well. This can be appealing to a new player, but with any deck it will take some time to really get the hang of all the interactions. The most important thing to learn about playing DelverBlue, or any Counterspell based control deck, isn't knowing your own deck, but more importantly knowing your opponent's deck. It is very important to know what the key cards are in your opponent's deck so you know what you should be looking to use Counterspells on in order to maximize their efficiency. The deck type that I have classified as "Storm" is actually quite a variety of different decks. There are three main cards in Pauper that have the storm ability; Empty the Warrens, Grapeshot, and Temporal Fissure. While Temporal Fissure has made its place within two different deck types, the Storm deck that I am referring to here is the ones that focus on winning with Empty the Warrens as well as Grapeshot. The deck above is just one of the many versions of this deck that have seen play within competitive Pauper. Some decks use Kiln Fiend for an extra kill condition, some don't run Grapeshot/Empty the Warrens, some run both, some are UR, some use only red mana ramp, some use Cabal Ritual, and for some the mana color doesn't matter. Now this deck runs along the more traditional lines for powerful storm decks, using those low cost red mana-ramp spells in order to create the mana needed to draw lots of cards and play a Grapeshot for 20+ or Empty the Warrens for 10-20 and maybe even a Goblin Bushwhacker. Kiln Fiend has been a great addition to the deck because it provides yet another way to win the game for the storm player. I know I personally have lost on turn 2 against this version of the deck to a Kiln Fiend. Another recent addition to the deck has been Gitaxian Probe, which adds to the spell count and can be played for 2 life in order to preserve mana. There is one quick way to determine that you're playing against a Storm deck. When your opponent's first land is one of the tapped lands from Mercadian Masques or one of the sacrifice lands from Invasion then you're going to be playing against Storm 100% of the time. These lands have great appeal for the Storm deck because of their ability to produce more than one mana from a single land, thus helping the Storm player to accelerate towards "going off" (a term used to describe when a Storm player combos out by casting a bunch of spells and then a card with storm). However, Storm decks are getting more creative as they find themselves with a number of different options available to them for ramping up the amount of mana that is in their pool. Most of the best mana ramp spells, Rite of Flame for example, have actually been given to us at the common rarity. This means the Storm players has the choice from a number of red spells and black spells in order to help them in going off. I have even seen some versions of Storm these days using a tactic where they have Empty the Warrens in their maindeck as the finishing combo without Grapeshot, but in the sideboard they'll have the full set of Grapeshots in order to effectively change the focus of their deck for the second game. Grapeshot is the harder of the two storm cards for decks to deal with. Options for dealing with an Empty the Warrens storm are easier to come by than those for Grapeshot since you'll need something like Prismatic Strands in order to prevent the damage. Playing Storm is not something that is recommended for the newer players. When you're running a deck that is focused on the storm mechanic it will require not only a bit of luck, but incredible knowledge about the version you're currently running, as well as a bit of math. In my opinion, this deck is the one deck in Pauper where you really need to know how to aggressively mulligan in order to set yourself up with a winning hand. I'm not going to go too far into detail on the how-to of Storm since, until just recently, I didn't even own a set of Grapeshots. That should give you an idea of how familiar I am with this deck. I consider myself to be a player with slightly more experience than average and still I find that playing Storm correctly is a difficult thing to do. The existence of the IzzetPost deck revolves completely around the printing of Glimmerpost in Scars of Mirrodin. 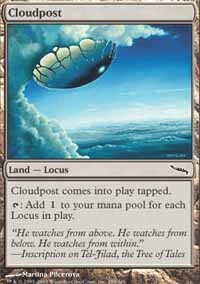 Before the printing of Glimmerpost, the only way to ramp up the mana of Cloudpost beyond four was through the use of Vesuva, which was out of reach for players interested in Pauper. As soon as Glimmerpost was printed an entire deck type was born that focused completely around these two lands. 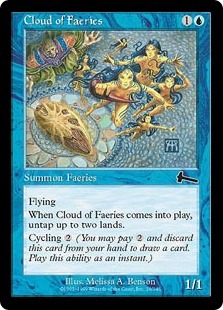 By including both Glimmerpost and Cloudpost in a deck, a player could (at a full eight in play) tap Cloudposts for eight mana each and gain up to eight life off of Glimmerposts. Those who have put any amount of time into competitive play are more than familiar with the many variations of the post deck including things from GreenPost to RebelPost, but the real front runner was a deck titled IzzetPost. IzzetPost, as you may expect, is a deck that uses blue mana for Counterspells and bounce as well as red mana for burn and creature kill. Because of the deck's ever increasing mana base it has made use of many cards that have not seen regular competitive play due to a converted mana cost that didn't match the cards basic power. Odd cards such as Mysteries of the Deep, Capsize, and Mnemonic Wall found their place within this deck. The heavy mana from the Cloudposts has also allowed Condescend to become a relevant Counterspell since its X cost is easily obtainable. Interestingly enough, for a blue control deck, IzzetPost is usually very light when it comes to Counterspells. Most of the time you'll see IzzetPost decks running something along the lines of three Condescends and two copies of Prohibit. Even though the odds of drawing into one of these is relatively low you have to take into consideration the fact that a good majority of the deck is focused on tutoring or drawing out the cards you need to make the perfect plays. So where does the frustration come in when playing against this deck? Where is the control if not in Counterspells? Well most of it is coming, surprisingly, from the Lightning Bolts and Flame Slashes. At a glance Flame Slash has been overlooked in other formats because of the fact that it only targets creatures, but that works perfectly for a format like Pauper where even the control decks are creature heavy. Like Storm, there are so many different versions of IzzetPost. One of the key parts of the deck is Mystical Teachings and/or Forbidden Alchemy. Mystical Teachings allows IzzetPost to function so perfectly as a toolbox of sorts and even the flashback cost is easily obtainable thanks to Cloudpost. Being able to run a significant number of single cards allows the IzzetPost player the opportunity to gain advantage in more matches game 1. Everything varies from the number of creatures to the different options used to build up the teachings toolbox. IzzetPost decks gain mild benefit from the use of Prophetic Prism as well, which allows the player to easily flashback the Mystical Teachings. Even in mono-colored post decks Prophetic Prism can be an important part of the deck since it gives the player a chance to filter out all the excess colorless mana in order to make up for the fact that the deck is short on basics. The finisher for these decks is of course either Rolling Thunder or Kaervek's Torch. These cards are a perfect fit for this deck since you can quick ramp up you're mana to the point where you can do X=20 to your opponent. Rolling Thunder can be the most effective choice between the two since it gives you the ability to clear off a battlefield that is full of an opponent's creatures. IzzetPost decks have little need to run more than a single copy of either of these cards since they are almost always running the Mnemonic Walls, which can give the player additional chances to make the play. The whole deck operates around this concept of using Glimmerpost to stall for time until the point where the deck finally draws into the win condition. Oddly enough this is another deck I usually recommend that newer players stay away from. The deck seems pretty simple at first glance, but if you're not familiar with or otherwise uncomfortable when it comes to mulligans then this may not be the best choice. There is a lot to be said for being able to have a hand that has posts in it and being stuck on basic lands really can hold you back. The other reason I usually speak out against this deck for the new player is because there are so many versions. Each player has their own variation that has come about as the result of testing and guessing regarding what will be best against the expected meta-game. As a beginning deck it can be a bit daunting when it comes to making card choices and knowing what the right moves are. MonoWhite Aggro is a deck that is focused around a large quantity of low cost creatures in order to power out more creatures than your opponent can kill. What this deck often benefits from, just like other aggro decks in the format, is the fact that there is no efficient/easy way to wipe the battlefield. There is no Wrath of God nor Damnation to worry about so the odds of running into such an answer are significantly lower. MonoWhite Aggro decks are known to run around 30 creatures and includes such powerhouses as Guardian of the Guildpact, Loyal Cathar, and Razor Golem. 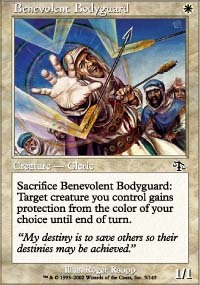 Benevolent Bodyguard has always been a one-drop MVP for the deck because of its ability to help the player avoid kill spells and protect important creatures. Squadron Hawk has been a great concept as one solution to aggros chronic issue. The problem that aggro decks often run into is they drop their hand really fast and then run out of steam if their opponent has been successful in keeping the creature count down. What Squadron Hawk provides is an ability to quickly add additional creatures to your hand. There are a couple of other, classic creatures that have been a staple of MonoWhite such as Leonin Skyhunter and especially Icatian Javelineers. The Icatian Javelineers are an effective one drop that have the ability to, once per Javelineer, deal a point of damage to target creature or player. This ability works great in the DelverBlue match since it helps reduce the Fae count against a Spellstutter Sprite or kill off a Delver of Secrets before it flips. It also can control other important creatures such as Glistener Elf, Liliana's Specter, and Disciple of the Vault. Another big staple of this deck is Bonesplitter. This is the one artifact that has been in the format for what seems like forever. Of all the possible equipment options that we have available to us in Pauper, none comes even close to Bonesplitter. For the simple cost of two mana, the MonoWhite Aggro player has the ability to give a creature +2/+0. With a turn 1 Bonesplitter you can be facing down something like a 3/1 Doomed Traveler on turn 2. The deck is often considered to be light when it comes to removal (usually only running 3 or 4 copies of Unmake). When it comes to keeping your opponent's creatures under control, the MonoWhite Aggro deck has to be smart about making moves during combat. I have always considered aggro decks to be a great starting point for a newer player and they don't get much more aggroer than this. Of all of the possible aggro decks someone could play in Pauper, none have as many creatures as MonoWhite Aggro. Most of the time this deck comes down to doing nothing more than playing creature after creature. As I hinted at earlier, most of the creature control is done through smart plays in combat with blocking and/or attacking. This becomes a great opportunity for a new player to learn the basics of combat and how to best handle certain battlefield matchups. Another big plus is the fact that MonoWhite has a lot of fantastic options for sideboarding. There are many great answers for other popular decks in Pauper such as Prismatic Strands, Dust to Dust, and Holy Light. Since the introduction of the Affinity mechanic to Magic we've seen a variety of different, artifact-based decks that have been titled as such. Most of the time these decks aren't even focused on using the mechanic, but instead may just bring in a couple of the bigger names from the original set (Frogmite, Myr Enforcer, and Thoughtcast). The Pauper version of the Affinity deck follows suit and uses other mechanics such as metalcraft to really work as the backbone of the deck. While a fast pace can be achieved thanks to the affinity ability on things like Frogmite and Myr Enforcer, the real support for the deck comes in the form of things such as Carapace Forger, Auriok Sunchaser, and Galvanic Blast. 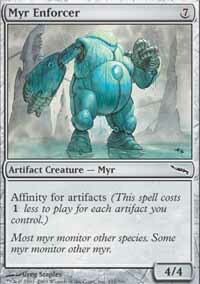 You'd almost be just as justified to call this deck-type "Metalcraft" as opposed to Affinity. During my time as a Pauper player I have preached about this magical number, which bumps a creature out of typical range and into "hard to deal with" mode. This number is four. At four toughness your creatures are now well out of range for Pauper staples such as Lightning Bolt, Echoing Decay, Agony Warp, etc. Creatures with four toughness are also hard to deal with during combat since we have a relatively low power curve overall. While four toughness isn't a line where all of a sudden you cannot do anything against it, but it does make a creature harder to deal with. When you take a look at the majority of Affinity decks you'll see that they are usually running a full set of Myr Enforcers and Carapace Forgers, which both sit at that four toughness line. When you add in the fact that Myr Enforcer can be played as early as turn 2 and now you have something to write home about. Affinity decks have also gotten some love from fliers such as the Somber Hoverguard, which provide not only the obvious evasion, but it almost becomes critical in the format itself to have some type of flier in order to deal with such popular decks as DelverBlue. If you take a look at it even things like MonoWhite Aggro and IzzetPost bring in fliers. However, there are two creatures that tend to define the power level of this deck-type even better; Atog and Disciple of the Vault. Disciple of the Vault was the backbone of a lot of Affinity decks both past and present, but isn't guaranteed a spot in the Pauper version. Several use it alongside the Atog for an easy win-con, but it isn't necessary. Affinity has the ability to beat down opponents with a variety of creatures or could focus on another win-con with Atog in the form of Fling. With Fling you only need to sacrifice five artifacts to make the Atog an 11/12 creature, attack for half your opponent's life, and use Fling to finish the job. With fast creatures and possible burn damage you don't even need to take it that far. The biggest hold up that Affinity has, much like other aggro variants, is the fact that if you continue to play out creature after creature and drop your hand fast through the affinity ability, you set yourself up to be in topdeck mode in the early stages of the game. This becomes especially true for Affinity because of the fact that it uses a number of one drop creatures and artifacts as well as those affinity creatures to get the aggressive start. The deck balances this out with help from the cantrips we get through those mana artifacts. Things like Chromatic Star, Prophetic Prism, and/or Chromatic Sphere allow Affinity the chance to work towards rebuilding their hand. Chromatic Star especially is a must have card for the deck because it doesn't have to be used for color changing in order to be able to draw a card. The other staples for draw include Thoughtcast, which can be simply played for one blue mana, and recently Rush of Knowledge, which can combo with Myr Enforcer in order to draw seven cards. Being able to fill your hand is critical with this deck, especially if you come across a control heavy build, which can strategically keep key creatures like Atog under control. Affinity can be a very user-friendly deck for the new player to the format. I do, however, recommend two things... be able to properly do math and make sure you're playing a version of the deck that has at least one copy of Rush of Knowledge. Where this deck really finds an advantage can be in the DelverBlue match because it has a lot of cards that DelverBlue will want to try and Counterspell. This allows the player an opportunity to effectively play around Counterspells by drawing them out (and the ability to play 4/4 creatures for 0 mana doesn't hurt either!). The deck can find trouble against things like Stompy, which has gotten a lot of power out of recent pump spells like Hunger of the Howlpack. You will be able to handle other aggro decks that don't have such a focus on pump spells, but Stompy can cause you some angst. Perhaps one of the worst matches would be MonoBlack Control since they tend to run not only a significant number of creature removal spells, but the discard will work in conjunction with your own ability to empty your hand and get you to the point of "topdeck mode" faster. Against things like Storm it will really come down to your sideboarding abilities since there is very little in the maindeck that is specifically focused on a particular match. The basic idea of Affinity is that it runs as a typically fast aggro deck, but really has few tricks up its sleeve beyond the Flings so you'll have to rely on your sideboard for filling that gap. Oddly enough it would seem that the second tier has a heavy focus on aggro based strategies. Our next deck is going to be the MonoGreen Aggro deck, which is best known as Stompy. I'm going to do my best to give a rather generic look at this deck, but I really want to stress that if you're interested in picking up this deck for yourself you go check out this article, which was written by PureMTGO's own deluxeicoff because he went into great detail and really did the deck justice with his description (also take the time to read the comments because he made several updates to it after the article went up on the site). So to sum up the Stompy deck in a single sentence... Stompy is a MonoGreen Aggro deck that pairs low costed creatures with creature pump spells in order to do big damage fast. As deluxeicoff notes, "Stompy is a very consistent deck". The creature base for the typical Stompy deck never goes beyond the 2cc slot and has recently obtained two creatures that have quickly become staples of the deck; Young Wolf and Wandering Wolf (someone totally has to make a tribal Wolf version of Stompy!). Young Wolf was a no brain addition for Stompy since you can play it one turn 1 and when your opponent does manage to kill it off it simply comes back bigger than it was before. This creature dares your opponent to either block or kill it and if they don't then you simply add on a few pump spells to make them regret the decision. Now the use of Wandering Wolf is a bit more interesting as it sometimes has been used as a replacement for Shinen of Life's Roar. Shinen of Life's Roar was a key part of the Stompy deck as it would force your opponent into a situation where he could only block the Shinen and all of your remaining creatures could slip past for the kill. The use of Wandering Wolf has also provided a great pairing with Skarrgan Pit-Skulk, which has the same ability to bypass your opponent's possible blockers. The final feature creature is going to be the Quirion Ranger, which allows the deck to make do with an average land count of 17. Beyond such small and powerful creatures, the deck really gets most of its strength from the non-creature spells. Vines of Vastwood is an automatic four count card because it not only makes your creatures bigger, but it can protect them from opposing removal spells. Similarly you can protect your creatures from the removal limits of things like Lightning Bolt or Agony Warp by simply increasing their size. Since most of the pump spells in the deck are instant speed you can use them in response to a removal in order to help bypass the kill. Groundswell gives you a great option for creating a blocker that will kill, Gather Courage can be played by simply tapping a creature, and Rancor gives trample as well as coming back time after time. There is nothing bad that can be said about any of these options and they all provide the Stompy player with plenty of options to manipulate combat in their favor. 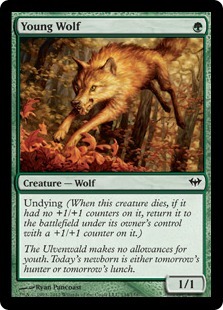 The recent addition for non-creature spells was Hunger of the Howlpack, which can give a creature +3/+3 permanently. When this is combined with things like Young Wolf you can quickly get that little guy up to 5/5 and as soon as that happens you're in a great position to win. Of all the aggro decks that are out there for Pauper I am going to go out on a limb and say that, in my opinion, Stompy is the strongest. That being said being the strongest doesn't mean that it is going to be easy to play. If you compare Stompy with something like MonoWhite Aggro you'll see that there is little thought behind MWA beyond putting creatures into play. While Stompy relies on a similar strategy, it does take a bit more thought and strategy to decide when the best time is to play a particular pump spell. Players can enter into this level of playing chicken against a control opponent thanks to how the game plays out. If you play your pump spell first then they can simply play a kill in response and they obtain a two for one advantage, but if you wait too long to attempt to make the play then you may find yourself in the damage step and the opportunity missed. I'm not saying that a new player can't play Stompy, but what I am saying is that this deck, like any other, requires testing in order to understand how to play it out. Take the time to play games in the practice room and actually learn the different matches with this deck. The Infect mechanic was something that was not entirely defined until Scars of Mirrodin block. Prior to that time we were introduced to a similar concept on older cards like Crypt Cobra, which simply had text that dictated the application of poison counters. When this idea was turned into a named mechanic, it also gained the added bonus of applying damage as -1/-1 counters in a similar fashion to wither. From the beginning of our Magic lives we are told that the way to win is to reduce an opponent's life or deck to 0, however over time we've been introduced to creative ways that we can cheat this. Infect is one such way that says that as long as we manage to get a minimum of 10 poison counters on an opponent we win the game. Now I'm not very good at math, but I do know that 10 < 20. Within the many infect creatures that were printed during the Scars block we were given several that came in at the common rarity and thus the deck type was born. The idea behind the deck is simple... use pump spells in order to quickly apply the 10 poison counters necessary to beat an opponent. Playing Glimmerposts? Infect doesn't care. Gain as much life as you want because in the end it won't matter. The Infect deck has made great use of Invigorate's drawback because of this simple fact. Since life gain means nothing to an Infect deck the card basically reads "Pay 0: Target creature gains +4/+4". Other great, non-creature, additions to the deck include a handful of spells that make use of the Phyrexian mana symbols, which allow players an opportunity to either pay the mana or 2 life in order to play the spell. Things like Apostle's Blessing and Mutagenic Growth can now be played for life instead of mana, allowing for faster play over a very low mana curve. Looking beyond the many great creature pump spells that Infect has available to it there is another card that I feel is the most important card to the deck... Glistener Elf. In competitive Pauper only Storm and Infect have the ability to win the game on turn 2. Between these two deck types Infect is actually the more consistent of the two in this aspect, which may come as a surprise to many players. 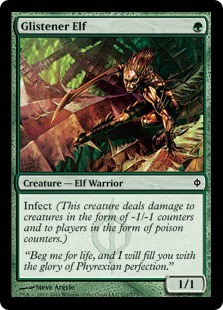 Without the use of Glistener Elf the Infect deck would not be able to pull off that turn 2 win. By playing Glistener Elf on turn one the Infect player finds himself in a great situation to avoid things like early Counterspells and provide quick, high damage attacks on turn 2. Against many decks in the format a turn 2 attack will be able to damage an opponent before they are able to even put down a potential blocker. This deck can prove a tempting opportunity to the new player. The concept behind the deck is pretty straight forward (play creatures, make creatures big, win game) and it wins games fast, but this can be a bit misleading. Infect decks can be vulnerable to other decks that run a heavy control package due to the fact that it runs so few creatures. A few lists have increased the number of creatures beyond the example above, however it is usually a minimal amount. The deck really doesn't want too many creatures so that it can keep the land count low and the pump spell count high. This does mean that the deck can be oddly difficult to play. Against a well seasoned control player it can become harder to identify the ideal opportunities for casting pump spells. A player may sit there and dump their handful of pump spells in an attempt to win a game only to have it answered by a simple Doom Blade if they aren't careful. This can be balanced the same way other decks balance their player flaws, through practice. Beyond that I would say that we're currently in a meta that is favoring control decks like Teachings, which make Infect a bit less friendly to play. Goblins are not only a classic tribe within Magic, but they've managed to be a destructive force in a number of different formats throughout Magic's history. The plan behind these Goblin decks is the same no matter what the format... create a swarm of creatures in order to run over your opponent. Pauper's version does this pretty well. In comparison to other aggro decks within the format, Goblins does not use a handful of non-creature spells in order to make their weenies bigger, but instead really relies on a larger creature count in order to achieve the necessary damage. These creatures are instead backed up with burn spells, which all the deck to be both proactive and reactive depending on the situation. One of the most important of these is Death Spark, which has been a fantastic addition to the deck. With the ability to constantly recur this spell you're able to kill off a number of creatures in important matches like DelverBlue or continue to deal extra damage to your opponent each turn. The only drawback on Death Spark is the fact that it requires a creature directly above it in the graveyard, something that is easy to obtain when you're running so many. The creature base for Goblins decks may have slight variations, but there are some key components that the deck really relies on. The first aspect is shown in creatures such as Goblin Cohort. These creatures come in with a cost to power ratio that is incredibly favorable. Being able to pay only a single mana for a 2/2 creature gives this deck its speed, but all things come with a drawback. In this case these creatures cannot attack unless another creature is cast this turn. By running such a heavy creature base this type of drawback doesn't matter. This is similar for decks that run the Mogg Flunkies, which have no problem finding another creature on their side of the field to attack alongside. Another great benefit to the creatures in a Goblin deck is the fact that many of these powerful creatures were reprinted under a different name in another set. This is mostly a result of the fact that Wizards have basically designated two different names for Goblins. The first would be simply Goblins, but the second is Mogg. While both have the same creature type, the difference in name has allowed the deck to cheat the rules and run eight copies of a single card instead of being limited to four. We talked about Goblin Cohort, but it has a double in Mogg Conscripts, which works in the same way. Now if you look at the example deck that I have provided here you'll notice that it does not take advantage of this particular double and that is pretty typical. 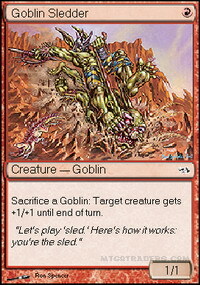 Instead, Goblins decks will take advantage of a much more powerful double with Goblin Sledder and Mogg Raider. These creatures have the ability to provide heavy aggro and allow you to create a way to avoid control spells. With the ability to sacrifice goblins you can avoid some effects from targeted kill or allow a creature to grow beyond the range of a Shock spell. 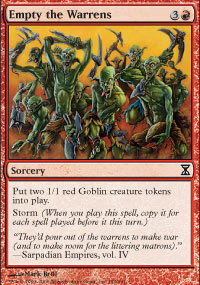 I have always felt that Goblins works as a great introductory deck for a new player to Pauper. The deck brings about the simple strategy of throwing down creatures, dealing damage, and winning games, but it does it at a very low cost. Another great appeal to the deck is the speed. So many people get irritated by the speed of things like IzzetPost, but with a faster aggro strategy you find that games are won or lost at a much easier pace. There are some very different variations of the deck so I recommend that anyone who is interested check out some of the decks that show up time to time in Daily Events. Some even venture away from a direct Goblin strategy by using powerful red weenies such as Martyr of Ashes (which adds to a direct damage strategy) and Jackal Familiar (which is yet another copy of Goblin Cohort). MonoBlack control is a deck that has been around for a long time in Pauper and those who have been playing in the format for years will understand the frustration that used to come with seeing Chittering Rats enter the battlefield. 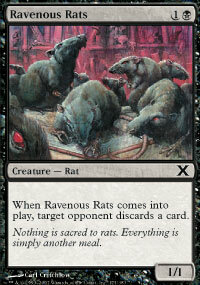 The most recognizable thing about MonoBlack Control was the heavy package of creature control options. The deck doesn't always run a lot of creatures, instead using the space for creature kill so that whatever creatures you did finally get on the field would do enough damage to win the game. However, the control option doesn't stop there. The deck could also bring in a decent amount of hand control through discard thanks to things like Ravenous Rats, which allowed the discard spells to be part of a creature as well. When it comes to creatures you come to a point where one is better than another based on the simple fact that it has an ability as well as having an efficient power to cost ratio. For the longest time the finisher for MonoBlack Control was Corrupt. Much like IzzetPost, the game plan focused on stalling for time by killing off creatures and making your opponent discarding spells he needed in order to win. At the same time you're able to use things like Sign in Blood and Phyrexian Rager in order to keep digging through your deck until you find the Corrupt that allows you to not only do a large amount of damage to an opponent while at the same time bringing your life back from the brink of collapse. Games would take big swings from one person leading into another based on a single Corrupt and it can be quite frustrating to play against. While Corrupt is still the force that it used to be, several versions of MonoBlack Control have even dropped the card all together, which is truly depressing. There are many options for customization with the MonoBlack Control decks as well. When it comes to options for creature kill there is no limit to the choices that black has available to it from targeted kill to edict effects, and most importantly a bit of crazy power/life off of Tendrils of Corruption. Decks have also focused more on the hand control aspect as well with things like Wrench Mind and Augur of Skulls, which have obtained a bit more popularity in recent weeks. Augur of Skulls for example brings in a lot of utility beyond the discard ability thanks to regeneration and the printing of cards such as Undying Evil. You can also focus your creatures more towards killing others with abilities like Fume Spitter and Cuombajj Witches, which work well against things like Infect or DelverBlue. When looking at all the possibilities for control decks within Pauper, MonoBlack is a more appealing choice to a newer player. If you were to sit down blind to a Pauper tournament using a control deck like DelverBlue then you would usually need some general idea as to what your opponent's decklist is like and what spells are the most important to target with your Counterspells. When running a deck that uses discard and creature control as their main control aspects it becomes simpler for someone who knows very little about the key cards in other decks to manage to make good choices as to what to kill. That being said there are things to be aware of such as hexproof and "sacrifice" abilities, which help an opponent get around your important kills like Tendrils of Corruption. "The term rogue has been adopted by Magic players as a way to describe a particular deck that does not currently follow the trends of a particular playing environment. With the addition of the internet as a factor in competitive Magic play, now players can copy decklists card for card. This leads to formats becoming flooded with only a few decks, which are rightfully the most powerful in the format (often referred to as Tier 1). Rogue decks are often considered to be inferior to the typical, Tier 1, decks and often simply considered as "bad". The basic concept behind rogue deck creation is to put together a list that is completely focused on taking down a specific deck, usually the one that is the most played in a particular format." This list is even further compacted then it could be if I wanted to break things down even more specifically. One example is the decktype that I've labeled as "JunkPost". Now I know that terming a deck as "Junk" gives it a specific type, which is usually associated with B/G decks, however I was using it as a term to classify all of the ridiculous, homebrew 8-post decks. Regular readers will be familiar with the fact that I have been on a soap box over the fact that Cloudpost has allowed Pauper players to put any random cards into a deck and win games, so the term "JunkPost" is my attempt to group all of those random homebrews together into one deck type to save space. Our total list of decks that have ended "in the money" sits at 50 and most of these are decks that will continue to show up now and then instead of being simply one win and never seen again. As you can see this best defines those decks that would be considered rogue decks as opposed to homebrews. While a deck may not pass the line of five showings each week some push that envelope week to week. Now this deck is a bit misleading because some of these decks (such as Teachings) have had weeks where they had more than five showings and therefore didn't classify as rogues, but it still provides the same general concept I'm trying to convey. The coolest thing this chart shows is the fact that there is an average of 16 rogue/homebrew decks that show up each week and win money, with seven of the fifteen weeks having about 20 or more rogues. What's the bottom line here? What exactly am I getting at with this? Well that's simple! Don't be afraid to homebrew! A lot of people will gripe over the fact that there isn't room for creative deck building and we're stuck in this new world of "netdecking". In Pauper there is a lot of room for new decks to be successful. Just make sure to take the deck into the Tournament Practice room and run through games in order to get a real idea of whether or not it'll pan out. Make sure you keep in mind the main deck types that I noted above and have a strategy for those matches. Most of the cards that will be considered "expensive" for this format are ones like Lotus Petal, which is a staple card for decks beyond this format. The expense of other cards will be a result of supply and demand where they may have come from a set that was released online years ago or was simply a set that did not see heavy limited play or player interest. That being said, even with the high cost of a few Pauper cards you'll find that a deck will be significantly cheaper than top decks in other formats. Before I go any further here I want to say that it is important to know that prices change on a sometimes daily basis, but what you're going to see will be relatively accurate because we rarely see a significant upswing in prices, especially in Pauper. With that in mind I have put in a significant amount of time to gather the following... below you'll see (in order) the fully broken down pricing on the top nine decks as listed above as well as the total for other popular decks in the format... Enjoy! When you see this graph you can get a great idea as to the cost vs. power value on these decks. The bars on the chart that are green are the decks from our first tier, orange is our second tier, and then red is the third tier. It may not be surprising that our top three decks round out for three of the top five most expensive decks in the format. The odder thing is that rogue decks like EnchantStorm and FissureStorm cost so much to put together, mostly as a result of using older cards as well as a few of the more expensive ones from our tier one decks such as Cloud of Faeries. What this chart also shows us is how a Pauper player can be successful without spending a fortune. The three decks from our second tier all come in at a cost below $15.00 to build the deck and even then only Stompy is over the $10 mark. I'm going to finish things off here with a quick look at what I do every other week when it comes to Competitive Pauper. Now for those who are not familiar with my articles here on PureMTGO.com I write a series that usually focuses in on casual Pauper, however every two weeks I add a section to my article that I call "The Competitive Corner". In this section I take a look at what the competitive playing environment for Pauper has looked like over the past two weeks with a series of charts and tables. For this article I am going to put those charts and tables here for you to get a taste, however I'm going to be using the numbers for all of the past weeks that I've been keeping track of the meta in order to not only give you a taste of what the overall picture has been, but give you a glimpse at what I offer every other week. Each week I start off with a link to a GoogleDoc that features a list of all the decks that showed over the past two weeks so that readers get a chance to see where my numbers came from. As you can see I follow the list of Daily Event results with a chart that is a bit easier for people to understand. I've always been the type of person who learns better visually so I find a chart like this helps a lot. As I mentioned earlier, any deck that has a weekly showing of less than 5 will be considered as a rogue for the week. This keeps the chart from being crowed up with unnecessary information and can help illustrate a clearer picture. As you can see this one gets a bit more crowded than usual because of the fact that it is working in all the decks that were not considered as rogue for the past weeks. The next piece of information that I provide is a look at how the top tier decks have been trending. Again, in order to keep the chart readable, I limit the number of weeks that I use for this information to the past six weeks (and again this is slightly different because we're taking a look at the whole as opposed to the six week limit). The numbers are generated based upon the percentage of the week on a whole for the specific deck. In order to remain on this chart a deck must maintain an average of approximately 5% over the six weeks. This is done in order to keep the decks on the list relevant to the current playing environment. Recently, I've added a small section to this where I am working on predicting what the continued trends will look like for the upcoming week. Hopefully this works out well! The final chart that I offer every week is a look at the strength of decks based upon how many undefeated showings they average. This list eliminates rogue/homebrew decks in order to again remain clear and relevant. Decks are listed in descending order based upon the most average undefeated showings and then by the most overall showings. Finally I finish off with a list of rogue decks for the week, which includes information regarding how many showings, if they had any undefeated showings (including links to those events), and thoughts on any new decks that may have shown up. If there was any other special Pauper events worth talking about I do that as well (i.e. TNMO). If you haven't picked up on it yet there is a theme that I strive for with the competitive Pauper information that I provide for you guys. I want to keep the information not only clear, but relevant. The whole idea is to create a useful resource for competitive Pauper players and I have made changes to things based upon player requests and suggestions. I have added pieces, changed how I look at statistics, and even reclassified decks in an attempt to keep things beneficial for you. I encourage readers to speak up and offer ideas and suggestions... while I may not take every one, the only way this information can be as useful as possible it requires community input and I'm happy to hear it! Well I know I am an individual who can never be accused of being short on words and I know I've been responsible for putting together some lengthy pieces, but this one may take the cake. Hopefully you've been able to get all the basic information you need about getting into playing Pauper from this article and if not... well I don't know what else you could need! No, but seriously if you have any further questions please feel free to ask them in comments below and I'll do my best to answer them to the best of my knowledge. I didn't include a F.A.Q. section like I did in the last article because I found that I was answering the questions in the article itself as I went and it seemed to contradict itself. Now next week I will be taking an actual to goodness vacation! I will be spending a week in San Francisco and away from any technology that would allow people to find me! Ok perhaps an exaggeration, but the bottom line is there won't be an article from me next week. Now before people get upset I know that it will be a competitive report week, but the off week is necessary. Don't worry I will be still tracking the information and then putting it up with my article the following week (which would have been an off week for our Competitive Corner) and then you'll get a second week of competitive reporting the week after so that we're back on track time wise! Did that make sense? Hopefully you guys can understand what I'm trying to say! I think I am finally ready to stop typing now so until next time!! Great article, really good overview for new players. The prices are a particularly interesting guide. Is it just me though or do some of the pictures not work? The PRE list and State of the Program prices pics are blank for me. I also often can't see the meta line graph in your competitive corner articles, but I assume others can because it's a pretty obvious gap :). I'd also note that in your pie chart you have WW listed as "monowhite control". Speaking of WW, the list you have looks a little odd to me, only 2 loyal cathar and 3 bonesplitter (more) and a singleton doomed traveller (either more or, preferably, less) all seem a little odd to me. The stompy main list looks good (although personally 16 is the sweet spot for land), but the sideboard is a bit all over the place. I can't see how naturalize isn't a strict downgrade from gleeful sabotage because you lose the 2 for 1 option (instant speed isn't that relevant), and I'm not a fan of spore frog - when you have a fog effect you don't want to be announcing your intentions! Anyway, minor points. Pauper is really healthy now and diverse on mtgo - you should have mentioned that the number of people participating in the event has doubled since a few weeks with no (apparent) reasons. @ semi: the reason for the increase in players is the switch of prize from m12 to m13... you reach this cycle where m12 was out for so long the value dropped and no one really wanted it because the prize payout did not cover the entry cost... when m13 came it gave players an opportunity to end up with greater prize value than entry fee, etc. Sorry, I needed to find my password (haven't used in a while) just so I could log in and give this 5 stars. People...you really need to throw some MAJOR props at this collosal effort. I know firsthand how hard and long a good article is to write here...and this is a stellar example. In fact, I'm gonna give JustSin a ticket next time I see him online to further promote such good effort. Imagine if this was where the bar was set for articles (main reason I stopped writing here). ?!? The page wouldn't refresh much, but it wouldn't need too...it'd be stocked full of quality articles people bookmark and re-read very often. This article should stay at the top of the main page for AT LEAST 30 days. It is so helpful and insightful for old and new players alike. This is an awesome article JustSin. Its exactly what a new player getting into pauper needs and its very useful for veterans to get a good look at the metagame. I'm definitely spreading the word about it. Keep it up! Thank You for all your hard work. I am an old school player that gave it all up in 2006. This article has me playing again! Most of the meta/deck informationhas changed with new sets and bans.